My mind raced back to a moment etched deep in my memory which occurred a long time back. Many years ago I had gone one evening for a swim to Khar Gymkhana and after having completed my swim came out of the changing room to the poolside on my way out, when I heard this beautiful melodious voice which stopped me in my tracks. I think it was “Chetichand Mela” celebration on the Khar Gymkhana grounds with a large gathering listening in rapt attention to a saintly figure, clad in white, seated on the stage. I stood transfixed listening to this marvellous melodious voice which sounded so loving, soothing, full of care yet had a great sense of inner-conviction and not unmixed with a twinge of sadness, all rolled into one. His message was a message to the Sindhis but I thought it applied to all of mankind. The flow of words, the way he elaborated, explained by giving examples was truly exhilarating. I stood glued to the spot till he finished, got down from the stage, humbly bid farewell and left the grounds. I made enquiries before leaving for home and learnt that the voice I heard and the diminutive saintly figure I had seen was that of Dada J. P. Vaswani from Pune. Off course I was aware that there was a Sadhu Vaswani Mission in Pune with a large following, doing some good work. But that was about all. I made up my mind to know more about the mission and the man. But as usually happens – intentions don’t always turn into reality and it remained a promise to myself that someday when I’m a little free from my business responsibilities I will find out more. We all make these promises, but remain entrapped in ‘Maya’, and usual worldly routines. So when Madan Jumani said “Why not Dada J. P. Vaswani?” I replied at once “off course – most definitely” Finally I get a chance to fulfill the promise I made to myself. But how do we go about it? Will he give his consent? “Leave that to me” said Madan “I have some friends in Pune through whom I will make the approach”. Sometime early June 2001 Madan called me and said “Dada J. P. Vaswani is coming to Mumbai and I’ve arranged a meeting with him this Sunday morning at PRABHU KUNJ. On the appointed day and time Madan and I entered the apartment where the host Ram Mirchandani graciously received us and asked us to be seated. And then after a few anxious minutes (will he agree? What arguments do I put forth if he doesn’t?) I was face to face with the person whose figure I’d seen from a far and whose voice and lecture had enraptured me a long way back. I was struck by the humility, the glow on the face, the serenity and simplicity of this divine being. He wouldn’t let me touch his feet, when I’ve heard of people who lay claim to be gurus feel offended if you don’t. Mixed emotions filled me, a sense of calm, peace and at the same time exhilaration with my heart pounding crazily. The visage was simultaneously that of a sage, a saint and a child. How could that be? Words failed me and I just handed a copy of my publication “SINDHISHAAN – voice of the Sindhis” so I could get sometime to compose myself while he glanced through it. “Ranjit Butani?” he said, “Are you related to Principal N. B. Butani” “Yes” I said, “He was my grandfather”. Whereupon Dada said, “You know he taught me physics at D. J. Sind College, Karachi”. He immediately put me at ease with this conversation and I broached the subject of wanting to shoot an episode on the Sadhu Vaswani Mission and himself. He thought for a moment – my heart skipped a beat – then he smiled and said “Yes – but co-ordinate the dates and details with Krishna”. There were several others waiting for his ‘darshan’. So I gestured to Madan and we got up. Immediately Dada looked around and stretched his hand and two packets of biscuits where placed in his hands which he lovingly gave us. Surprises didn’t cease – he saw us out of the door right up to the elevator and bid us adieu with folded hands. I was too stunned to utter a word to Madan on the drive back to office. WHAT A MAN! SURELY NOT JUST A MAN? Well Jumani and the Sindhishaan team went to Pune during August to shoot “A day in the life of Dada J. P. Vaswani” which we couldn’t resist from converting into 2 episodes from the 1 originally planned. 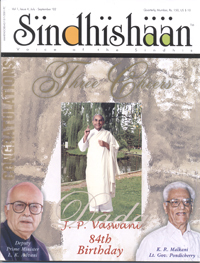 SINDHISHAAN SALUTES DADA J. P. VASWANI on his 84th birthday and prays for his health and long life. We need him to be here on this earth, with us for a great many years more. The real significance of India lies not in its historical sites, no matter how sacred, but in its continuing respect for the spiritual way of life and those persons who uphold it. For nearly forty years I have been privileged to live in this country, enjoying the religious freedom denied to me and my fellow countrymen and women in our own homeland. During this time, I have also had the honour of meeting many religious leaders and spiritual practitioners, both here and abroad. Amongst these the Revered Dada J. P. Vaswani, Spiritual Head of the Sadhu Vaswani Mission particularly epitomizes the life of Dharma. He is a living example of how the spirit and practice of our ancient traditions can be purely maintained, even amidst the changes and challenges of this modern age. Dada J. P. Vaswani has been carrying on the spiritual work initiated by his illustrious uncle Sadhu Vaswani. In the last three decades, I have had many occasions to meet Dada Vaswani in India and during Interfaith functions around the world. His humility, sincerity and loving teachings always make a deep impression on his audiences. Indeed, he seems to be infused with the spirit of love and compassion, and is a powerful proponent of our ancient ideal of Vasudhaiva Kutumbakam, the world is a family. Love of the divine and of one’s fellow human beings is the most potent way for spiritual development in the present Kaliyuga. Teachers like Dada J. P. Vaswani have an important role to play in propagating the message of universal love and fraternity around a world which is shrinking before our very eyes.